I Have Forgotten my Username? Imagine the luxury of stepping into a high-rise building’s elevator and alighting at the top floor to head straight into a larger-than-life office set-up! If you have an office like this, then who wouldn’t want to rush to the workplace before time to enjoy the fancy interiors and plush furnishings? The new age office complexes have transformed into workplaces that evoke productivity and congeniality through their stunning features. From hanging gardens and terrace lounges to entertainment zones and club-like cafeterias, these offices are loaded with exquisite interior design elements which make them enchanting as well as inviting. Obviously, commercial property for sale in Australia has adapted to this changing dynamic of property presentation. Since Sydney is the most sought-after city for setting up business headquarters and branches, it has witnessed a sudden spurt in the mushrooming of such swanky structures. Investments from foreign investors have further supported the opulence of these architectural marvels. If you too wish to acquire one of these extravagant places of commercial activity, then take a look at seven of the coolest office spaces in Sydney to end your quest. This stunningly placed office rests on the penthouse–level in the prestigious Trust Building. Recently renovated, the charming property overlooks the Castlereagh Street and offers striking views of the MLC Centre and the CBD skyline. Situated within the CBD, the workplace enjoys lots of activity and boasts of classy and historical attributes. The majestic entrance and grand main lobby give it a regal prominence. The area is experiencing the development of many new projects in the business district and is close to the popular Circular Quay, Wynyard and Martin Place. The grandiose of this suite is too splendid to be explained in words. To know more about this property, click on the link given below. This commercial property is a massive space spread across the floor and adorned with large window frontages that offer spectacular sights of Hyde Park. The prime location of this building makes it a lucrative opportunity for investors as the demand for commercial spaces in Sydney is on the rise. This blue ribbon location on Elizabeth and Park Streets comes with a modern fit-out, well-appointed kitchen, storage and restroom facilities. The floor plan can be comfortably subdivided into various cubicles and cabins depending on the usage of the owner. The marble finish lobby creates a signature style which gives this remarkable building a deserving entry. Easily accessible from the Pitt Street Metro Station and within the proximity of a plethora of cafes and restaurants, it is the best place to start an office or lease a commercial property for maximum benefit. To know more about this listing, click on the link given below. This strategically positioned office is a contemporary space exuding freshness and commercial vibrancy. The freshly painted property has been refurbished with new lights and carpet tiles recently and enjoys good natural light. The spacious floor plan can be subdivided and comes equipped with a well set-up kitchen and bathroom area. The rich finishing of the workplace and high-quality maintenance of the building ensure a suitable environment and extend a refreshing work culture. Positioned directly opposite to the Wynyard Place Development, it is quite close to the Circular Quay and Martin Place. If you wish to own this extraordinary property, then follow the link given below. This expansive suite has internal 72m2 space with four partitioned offices along with car parking and storage space. The premium property comes with a modern fit-out and is located just a few minutes away from the Town Hall, Museum, Courts, Chinatown and Darling Harbour. The impressive World Tower on Liverpool Street lies close to the celebrated World Square retail and commercial development. While the commercial property trends keep redefining the market, the demand for premium workplaces is not going down in the coming times. If you are looking for upmarket office space, then check out the link given below to grab it right away. Who wouldn’t want an office in the popular Chanel Building and when you can get your hands on the penthouse-level office space; it doesn’t get better than this! Recognised as a jewel in the crown of Castlereagh Street, this natural light filled expansive workplace comes with an enviable position in the CBD. Offering dazzling sights of the Sydney skyline and King Street, it boasts of a classy fit-out. Equipped with a magnificent reception area and an excellent boardroom, the prominent property is embellished with an attractive new facade. With the famous Chanel flagship store at the ground floor level, this building has an illustrious presence in the precinct. If you want to acquire this office, then follow the link given below. 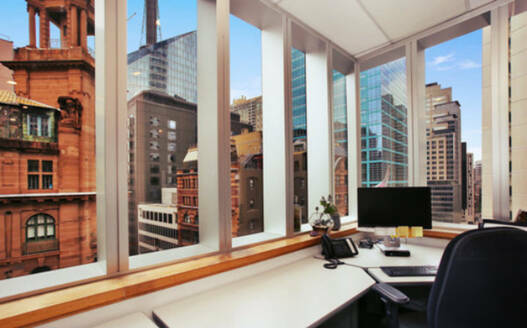 Here is a prime office space located in a world-class 10-storey commercial building in the heart of the Sydney CBD. Standing tall on the corner of Sussex and Liverpool Streets, the structure is within the vicinity of Town Hall Station, Darling Harbour, Hyde Park and Haymarket. Offering 24-hour security access, the well-partitioned office is blessed with bright natural light. The workplace can be leased to business owners as well as created into a co-working office space which can have many tenants at the same time to earn more profits. If you are interested in this property, then check out the link below for more information. Welcoming workspaces are a treat to the eyes, and so is this fantastic property which covers an entire floor. Exquisitely crafted and well-maintained, this classy and chic structure enjoys a versatile fit-out. The premium property has a mixture of offices and large open workspaces, kitchen, bathroom and shower facilities. The iconic commercial building is a landmark in the CBD area and is surrounded by a myriad of new developments. The place is close to many restaurants and bars which ensures the entertainment of the staff members. If you wish to reignite your business by acquiring this property, then click on the link given below. With Sydney being the epicentre of trade, the demand for stylish and productive office spaces is on the rise. If you are looking for commercial property for sale in Australia, then catch hold of the workplaces listed above to expand your investment portfolio or give your business a new lease of life.